The blood is sticky, thick and bright red (crimson in fact). The original Kensington Gore was a specific brand of proprietary stage blood manufactured by retired pharmacist John Tynegate in the '60s and '70s. It can be seen in a lot of old horror films, especially the Hammer Horror series. Plain chocolate syrup is still used in black and white films as brown looks more like blood than red would in monochrome. See also A Bloody Mess. Dracula Has Risen from the Grave, especially the opening. Shows up Taste the Blood of Dracula, the sequel to the above when the eponymous substance starts take form in a goblet. A Hard Day's Night plays with this in a canteen scene: an actor uses ketchup first on his food and then on his "wound." Alfred Hitchcock allegedly did Psycho in black and white partly so he could use chocolate syrup swirling down the drain in the famous shower scene, instead of something more expensive that really looked like blood. The Evil Dead (1981): The amounts of fake blood used and the very, very sugary recipe (which Bruce Campbell actually gives and recommends in his autobiography) combined to leave every actor caked in unbearably sticky red mess at the end of every damn day of shooting. Campbell also mentions in his book that at one point instead of ripping, his dried shirt broke because it was so saturated with the stuff. In the Complete World Knowledge books, he is credited as an expert "on the subject of fake blood". Whatever The Shining used in the elevator sequence was significantly more watery than Kensington Gore. The sheer quantity of it was impressive, though. Sleepy Hollow uses a very similar-looking kind of blood, mostly as an homage to the Hammer movies, but also for artistic reasons. Burton digitally desaturated the color blue so everything had a distinctly grey cast to it and enhanced the color red so it would stand out more. The orange-ish stage blood used in Sweeney Todd: The Demon Barber of Fleet Street is also a Hammer tribute. As in Sleepy Hollow, digital desaturation of the color blue makes the blood stand out more. The famous prom scene in Carrie used a concoction known as 7-11 Blood mixed with food coloring. This fake blood wound up drying and sticking to Sissy Spacek's skin under the hot lights, forcing the crew to hose her down after each take. And they needed 35 takes to get the scene right. Lampshaded in Tropic Thunder, where Ben Stiller's character holds up a corpse's head and says that it is a prop, using corn syrup fake blood. Becomes a double subversion, since it is a fake head being portrayed as a real head while still being a fake head. Parodied in Tongan Ninja, when the blood coming out of Sione's mouth is a bright shade of fuchsia pink. This type of fake blood featured heavily in Kill Bill, as an homage to the Shaw Bros' kung-fu films that used the same sort. Also used was the authentic Shaw method of fake-blood-delivery, i.e., bursting condoms filled with the stuff. Monty Python and the Holy Grail. The Black Knight scene and the Killer Rabbit scene. 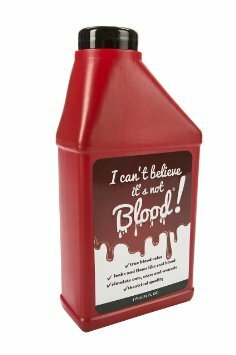 Uwe Boll LOVES this kind of fake blood. This is a key plot point in the first Scream movie. Billy uses fake blood to make it look as though Ghostface had stabbed him, giving a Shout-Out to Carrie in the process. Reservoir Dogs: Mr. Orange's gut-shot blood pool hardened during takes and Tim Roth had to be peeled off the floor after filming. The original Dawn of the Dead (1978) uses an extremely bright, opaque fake blood made from sugar cane syrup, peanut butter, and food coloring. Director George A. Romero loved it because he felt it matched the film's comic book atmosphere perfectly, while special effects supervisor Tom Savini hated it because he prefers things to look more realistic. Some of the older Godzilla films, particularly Godzilla vs. Gigan and Godzilla vs. Mechagodzilla, feature gallons of bright orangish-red blood being sprayed out of the monster suits during battles. The competing Gamera films of the same era feature sometime similar, along with some green and blue blood. The films of Herschell Gordon Lewis, the "Godfather of Gore" responsible for cult classics like Blood Feast and Two Thousand Maniacs!, feature blood so bright and thick it could pass as paint. Lewis had it made to order from a local chemist, and reached a point where he labeled his films as "two-gallon pictures" or "three-gallon pictures" based on how much he had to call in for. When 60 Minutes profiled drive-in movie mogul Earl Owensby, film techies were shown using Karo syrup and other ingredients to make this mixture. Used in the violent episodes of Saul of the Mole Men. Extensively. Averted in Forever Knight, which used a fruit drink named Ribena, which is the right color red and *extremely* sweet. In one episode of Face/Off the contestants had to mix up Kensington Gore and create a crime scene that was then critiqued by an actual retired homicide detective. Some of them used way too much. James Rolfe has commented on his long history with (blatantly) fake blood, which has ranged from ketchup to Kool-aid to the traditional corn syrup mixture. Red Zombie and The Deader The Better in particular are full of cheesy, bright red blood effects. Opera Colorado's "Catch Us in the Act" advertising campaign included a boast of having five recipes for blood. These included a peanut butter base for battlefield gore, a liquid laundry detergent base for blood on clothing, and a baby shampoo base used when there was a risk of the "blood" getting into the actor's eyes. Referenced by Gilbert and Sullivan, in the meta-sense. Knowing full well that the title was questionable and that the work in question would never top their previous masterpiece, Gilbert suggested renaming Ruddigore Kensington Gore, or Not Quite So Good as The Mikado.